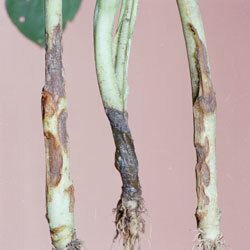 Damping-off disease primarily infects seedlings, causing rot. It's caused by several different fungi. 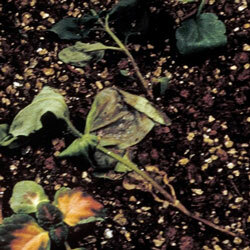 One form of the disease known as preemergent causes seedlings to rot before they even emerge from the soil. The other form, called post-emergent, rots stems, killing off the seedling. Symptoms include a fuzzy white substance growing on the surface of damp soil. You can prevent the disease using sterilized soil or even artificial soil mix for planting seeds.